Every so often, I love to do a Q&A with an Author on Pretty Little Memoirs before I review their book. 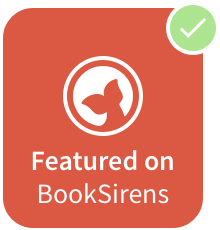 I love that it gives you all a chance to get to know the author and the book before I launch the review. 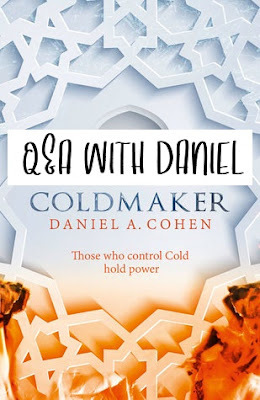 Daniel A. Cohen is the author of COLDMAKER, a new Fantasy book with high stakes and a killer storyline. But don't just take my word for it! I hope you love reading this Q&A and getting to know Daniel! Find out more about COLDMAKER here. Hello Daniel! I am so excited to have you here on my blog! Can I just start by saying how much Coldmaker sounds fantastic?! I know a lot of people I’ll be recommending it to / buying it for Christmas. Thanks so much for having me on your blog and for the kind words. The support is much appreciated, and I hope those that who choose to give Coldmaker a chance will find it worthwhile. Coldmaker is such a unique take on fantasy, edging dystopia. What inspired you to write in this particular genre? I’ve always been attracted to fantasy, as the genre is basically the equivalent of diamond-tipped bolt cutters. Fantasy is a weapon and a way out all at once, a skeleton key, lustrous and indestructible. There are so many locks and chains that bind this world (whether by natural laws, or the laws of mankind) and fantasy is our way out. Anything goes, and you can be who you wish, live where you want, love who you love. I read a lot of literary fiction, and I’m not one to turn away from thrillers or a good horror novel, and you’ll find a lots of sci-fi and humour books in my collection, but fantasy is my truest love. It’s the genre of imagination, the currency with the highest purchasing power. Coldmaker is my fourth novel, the previous three all having fantastical elements, but this one means the most by far, and took the most to extract. Micah is a striking, vibrant person to read the story of as a main character. What qualities of him do you see in yourself? Micah definitely started out as a two-dimensional pseudo-clone, but as the story progressed and drafts were layered on top of each other, he began to take on a personality of his own. For example, I am not nearly as brave as Micah, nor could I tinker my way out of a cardboard box, yet I like to think he and I share similar sentiments of the heart. He’s also rather inquisitive, which I can relate to as I tend to question everything, even when it’s not particularly beneficial. As a blogger, I don’t find myself reading a fixed genre and fantasy is one of my favourites! 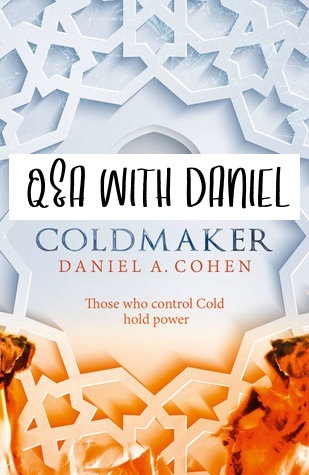 What would you describe Coldmaker as to someone who reads more contemporary novels? Actually I think my agent had fun pitching Coldmaker, as it’s not quite traditional in a fantasy sense. The biggest thing that sets it apart is from the staples of the genre is that there’s no magic, and also no knights or dragons or witches or vampires or inter-dimensional fae (not that I don’t love all of those things). In fact, the people in the story aren’t that different than us. It’s funny because even through Coldmaker is of course a fantasy novel, the focal points are all very human. The story is more about psychological struggles that I believe many of us face. It’s about rolling the dice, even when the dice are red hot and can burn your palm. It’s about the bonds of family, even when that family is not of blood, but of choice. Of course I’d have to ask you the most simple, but obvious question. If you had to pick: hot or cold? Well that’s actually a rather difficult question to answer, since a gigantic element of my book is the struggle against heat, but I guess since I traded in New York snow for Texas sun I’d have to say hot. Finally, there’s a ton of epic story-building in the book. What advice would you give to someone who is an aspiring writer in the dystopia/fantasy genre? Well considering it took five years, two full re-writes, and tons of drafts for the Coldmaker world to come together, I guess I would have to take the cliché route and say that fantasy worlds take time to form and you shouldn’t give up. But I guess on a more practical level I would say to learn to trust the back of your mind. As you write and build your world, you’ll find that your subconscious is laughably more intelligent and creative than the conscious, and it will perform feats of astounding connective magic. When writing fantasy, trust your deepest selves to guide the way, because hey that’s where the heroes and monsters live anyway. It’s been a pleasure talking with you today! 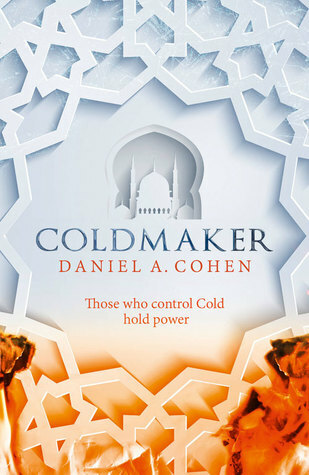 Coldmaker is out now and you can buy it here and add it to your Goodreads here!